As a kid I often played with my younger siblings in the forest, creating our own little tribe, collecting different materials and inventing various rituals. I guess I had a shaman-like role. I have a similar approach to working with performance art now, I like to create an alternative reality that I can invite the audience into, and to transform the mood of the crowd. It is closely connected to play and a way of exploring the world. 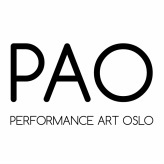 When I started my art education in Rogaland School of Art I wanted to focus on painting, but ended up exhibiting a video installation showing documentation of performance art and a live performance of my graduation show. There was a lot of a-ha moments in those years, so many impulses and (for me) new ways of thinking. One of the first works that comes to mind among my latest projects is the audio play I made together with Finn Adrian Jorkjen last December. It was a humorous and dystopic christmas calendar in which we released an episode each day of December as a podcast. We often make these very large projects where we mash up elements of pop culture, mythology and religion. This was right after Trump was elected, and everyone had the feeling that the world was falling apart, so it was a good timing for a gloomy audio play. as an encounter with the materiality of the world. It is a way of exploring the potential in the things which are available right outside of our doorstep, and to get connected to something bigger.